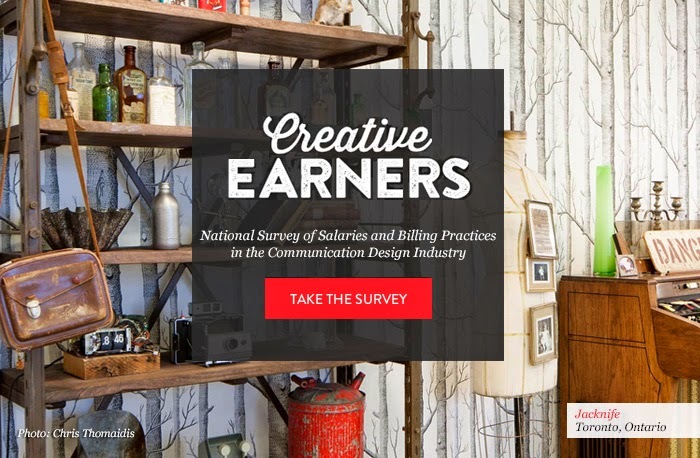 English and French versions of the National Survey of CreativeEarners, produced by the Association of Registered Graphic Designers (RGD) and Creative Niche, went live this week at www.creativeearners.ca. Providing insight into the financial trends facing Canada's creative sector, CreativeEarners offers a summary of how creative communicators are being compensated and valued. The survey, which closes on June 16, takes approximately 10 minutes to complete, and your information will be kept confidential. The information you provide will help RGD raise awareness of Canada’s thriving creative industry and produce an economic snapshot of our sector to help benchmark salaries and billing rates across job types, sector and region. The greater the participation, the stronger the sample size and the more valuable the data for every stakeholder working in or around Canada’s creative industry. $3,000 in prizes will be raffled off among participants, including 15 $100 Umbra gift cards to be used online or in the store. Where does your creativity happen? Help spread the word by tweeting photos using the hashtag #CreativeEarners. Photos will be uploaded to the image gallery at creativeearners.ca and featured at DesignThinkers 2014! English and French versions of the survey results will be made freely available to all this November. Fill out the CreativeEarners survey here before June 16! Help spread the word using the hashtag #CreativeEarners.